Hi everyone and welcome. 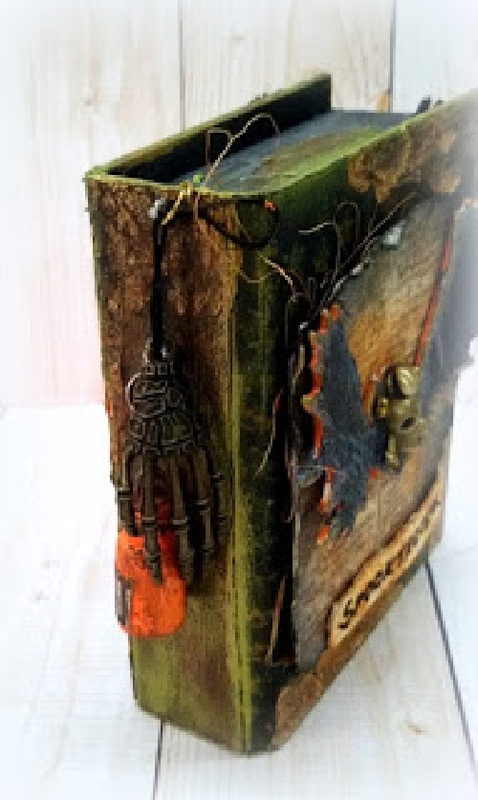 Today we have some 'Make it Spooky' inspiration from two of our recent Pinworthies; we welcome Rupa and Remya to share a project based on our current challenge theme. Hello! I am Rupa from Bangalore ( India) and am here with my Pinworthy guest post. I work from my studio at home and churn out a lot of projects with household trash. I love making home decor items with things that would normally end up in the trash can! I admit I had a few sleepless nights when Nikki told me about the “Spooky” theme here at AVJ and I thank the entire creative team for giving me this opportunity to make my first project in this theme! I made a book box, have used the lid of a packaging box for this. I have used the traditional spooky colours here as this was my first make. Once gessoed in black, I have stencilled with DecoArt sprays on the cover and layered with pattern paper from Tim Holtz Lost and Found stack. 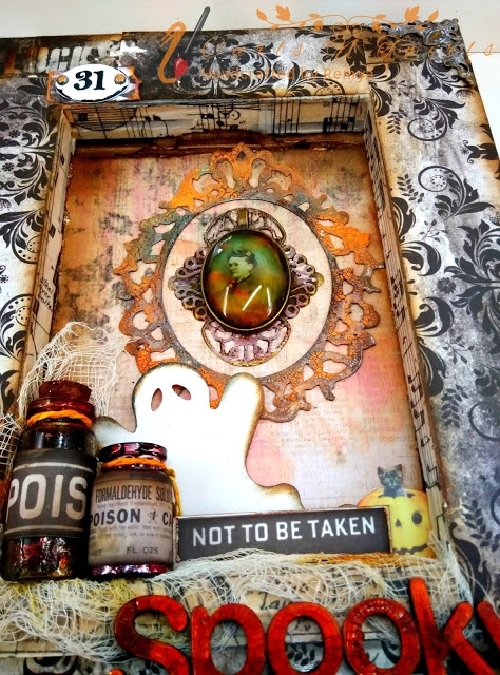 The focal point is a Tim Holtz alterations die that I won here at AVJ for the Secret Santa contest. Thanks Brenda. The bat was cut with chipboard and I have used crackle paint from DecoArt and highlighted with metallic lustre in burnished brass. The spine too has a few layers of colors using the dry brush technique and have added a few spooky charms too. 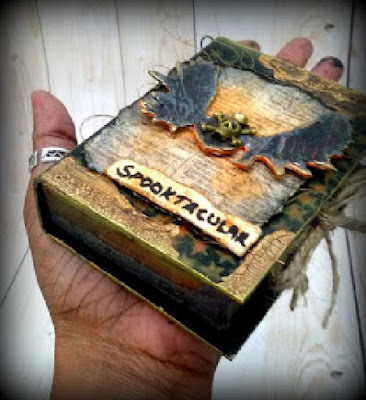 Once you open the box...there are 15 spooky tags that I inked and distressed to show the witches love the same, lol! 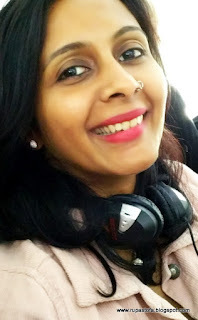 I am Remya, from Bangalore, India and I am super excited to be the Guest Designer at "A Vintage Journey" for the "Spooky challenge". An Electronics Engineer by Qualification, I took a break from my busy IT Career for taking care of our lovely son and this in turn got me lot of spare time which I started dedicating for my long lost love to crafting. Crafting, Painting and Sketching were my pastimes from a very young age. 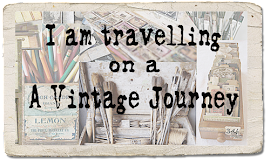 Even though I do not restrict myself to any particular style, Vintage is my favorite. 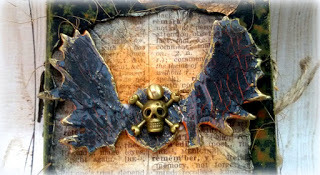 Am greatly influenced by Tim Holtz and his art work !! October is synonymous with Halloween. 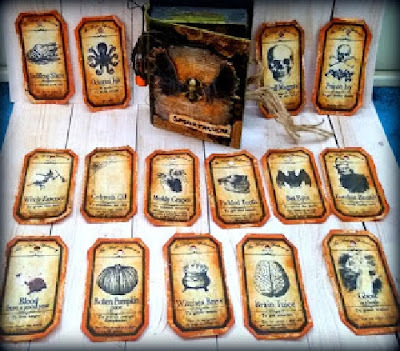 A day dedicated to remembering the departed souls including Hallows was aptly called "All Hallows Eve" which contracted to Hallowe'en or Halloween, and many activities go along with it. Carved Pumpkins - Jack-o'-lantern and many such SPOOKY themes are displayed everywhere inviting "trick-or-treating". And being October, there could be no better theme for an art work than "SPOOKY". Here below is my "SPOOKY" take. To start with, got a canvas nailed on to a frame and reversed it. 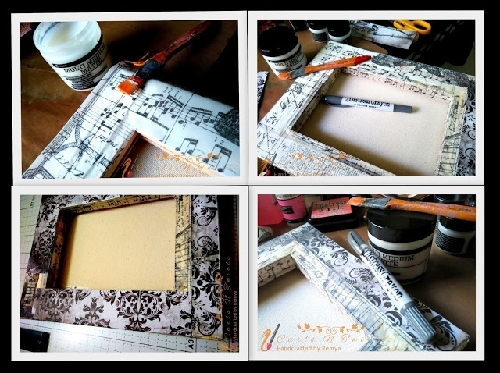 The open frame was then covered with Tim Holtz Eclectic Elements Melange with Multi Medium Matte. Sticking pattern paper directly in the inner periphery of the frame would have been otherwise difficult. Then blended Distress crayon Hickory smoke by rubbing along the inner edges. It gave a very smoky effect. I selected the background papers from the laboratorie stash, chose the 6×6 size paper of worn wallpaper. Stuck it along the edges and the substrate was ready ! Now for the embellishments to go into the frame. 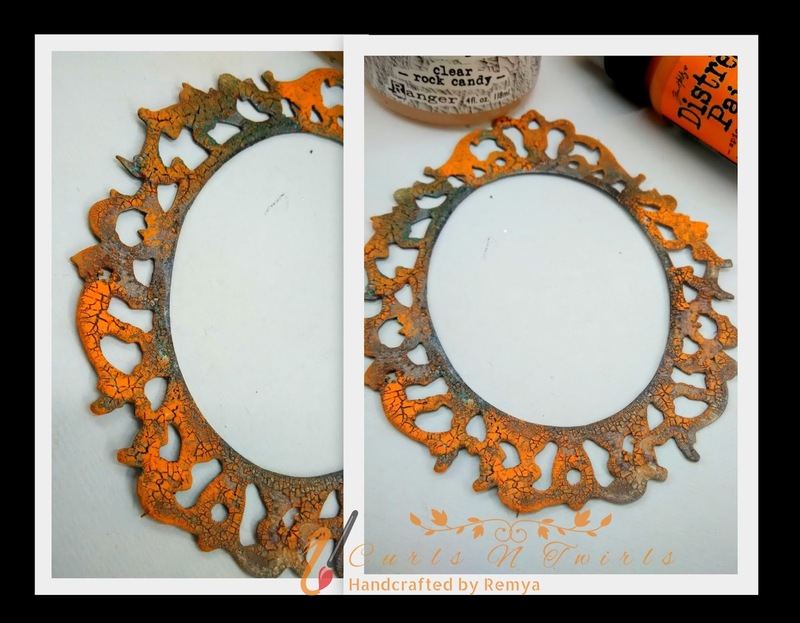 White card stock was cut using the Ornate Frame Die and applied distress crackle on it. Once dry applied distress paint - Spiced marmalade, walnut stain, hickory smoke over it. This accentuated the cracks. The bottles were given a coat of distress crackle (by now you would have guessed it - I Love Crackle) and set aside for natural drying. It needs to dry naturally to get the real crackle effect. Heating makes the crackle paint to bubble up. Once dry I poured alcohol ink into it and moved it around, so that it covers the entire inner part. The cracks and alcohol ink gave it a rusty look. The alphabets "SPOOKY" (chip boards) were first painted with distress paint: picket fence and spiced marmalade before applying distress crackle. I then cut out strips pf paper with poison labels from the laboratorie stash and distressed it with old paper dye and walnut stain. This was my favorite of all. I cut out the picture of vintage lady from the laboratorie stash to fit the inner part of the pendant. The glass dome to fit on it was given a coat of alcohol ink. I stuck it using glossy accent. The ageing effect it gave was eye catching. Once all the embellishments were completed, assembled them in the frame. The final bit - the ghost die is from Sizzix : Ghosts #2 Halloween Sizzix Originals Ghost Die. Hope you all enjoyed this spooky canvas frame. Two amazing projects ladies - thank you so much. I am in awe at all the wonderful details on them both - just fabulous. 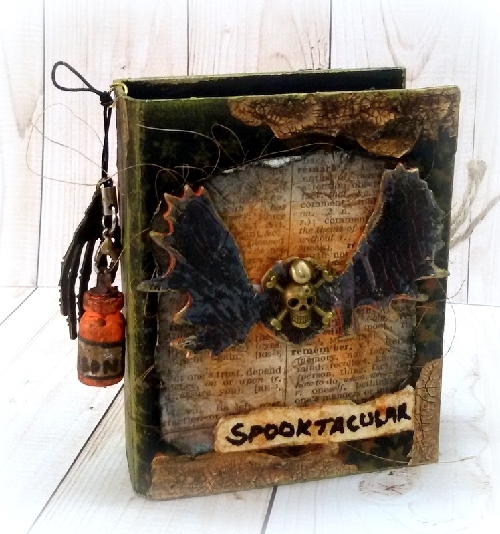 There is still plenty of time to join in our 'Make it Spooky' challenge - these creations have certainly inspired me! 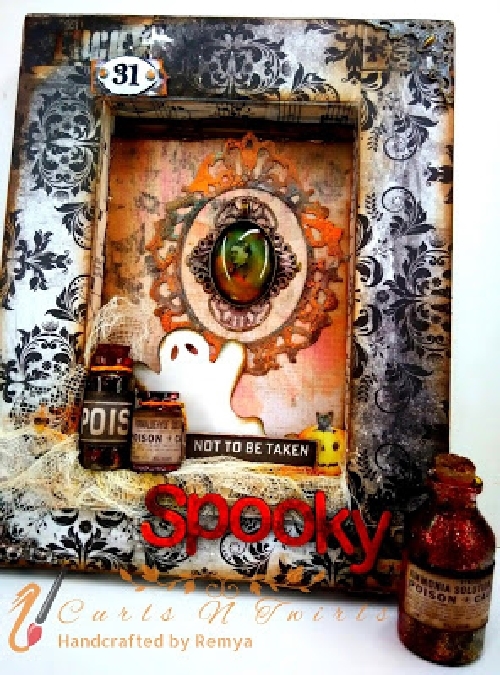 Spooktacular projects with fantastic effects, gorgeous!! Wow! fabulous projects from you both, pinworthy indeed!! 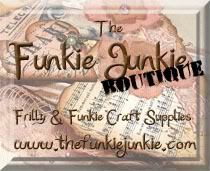 Oh ladies, you have both totally out done yourself, absolutely brilliant projects and perfect for our theme!! It's wonderful to see your work featured here!!! I really admire both of your projects, stunning work!!! 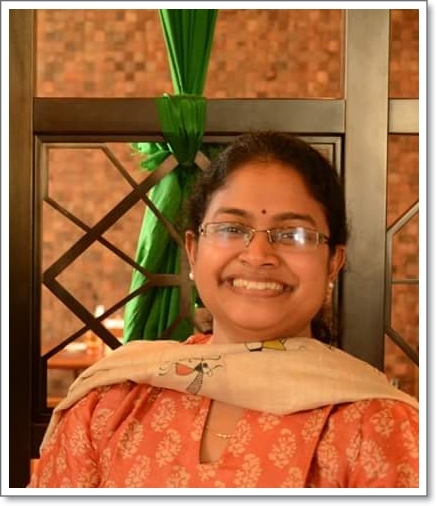 Welcome Rupa and Remya. Your projects are fabulous. You really have treated us to two wonderfully spooky projects - thank you for sharing your talent and creativity with us . 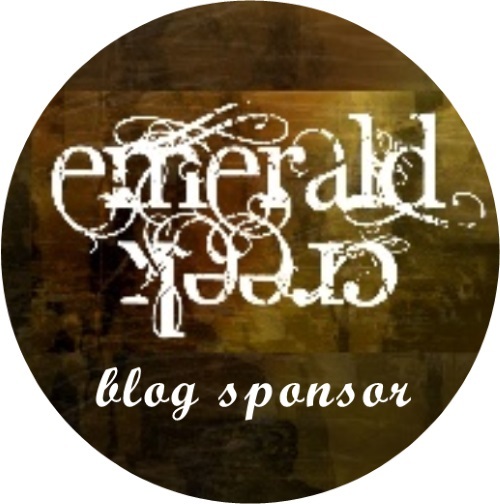 Glad to be featured here...a blog that I cherish, love, follow and admire. Thank you once again for this opportunity. Big hugs. 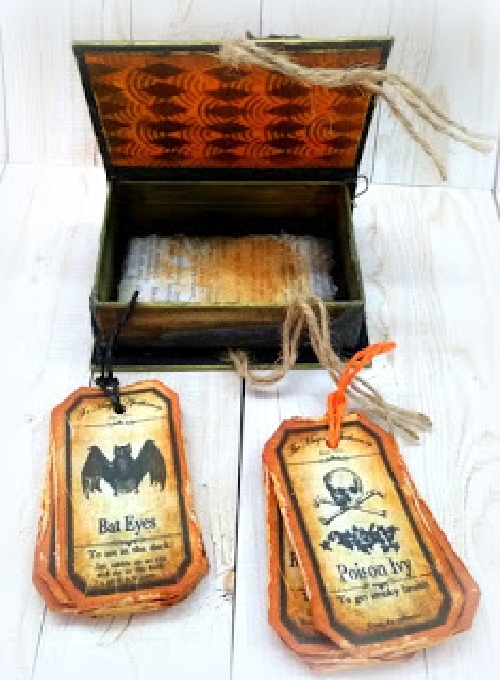 Brilliant projects Rupa and Remya, you really have captured Halloween in them with all the fun details and spookiness. Love them both. Amazing projects Rupa and Remya!! love the way you created the book box Rupa and those tags are amazing !! Remya, love all the details esp the poison bottles ! !